Peoples State Bank of Munising is a hometown community bank that is locally owned, directed and managed. It was organized in 1910 and has primarily served Alger and Schoolcraft counties. The bank has focused on providing complete banking services to its loyal customers for over 100 years. Visit our website for a complete list of our services. Member owned, Upper Michigan Community Credit Union offers a variety of high-quality financial services to its member-owners. If you live, work or own property in Alger or Schoolcraft County; or if you have a family member who’s a current member-owner — join today! This credit union is federally insured by the National Credit Union Association. We know you want wireless service that’s both flexible and reliable. From local and national coverage to weekend and anytime minutes, Verizon offers the variety you need on a vast network you can trust. Verizon phones come in all shapes and sizes with capabilities that are technically advanced and easy to use. Putvin Drug Store is also your convenient and comfortable neighborhood Radio Shack location, one of the nation’s most experienced and trusted consumer electronics specialty retailers. Hiawatha Telephone Company (HTC), originally founded as the Munising Telephone and Electric Co., has been providing superior-quality communications services to Munising, MI and the central Upper Peninsula since 1896. Today, HTC / jamadots offers its customers exceptional value with the latest in advanced communication services, including high-speed internet (with up to 150 Mbps download in the Fiber areas), local and long distance phone, and enhanced calling features. All of our products and services are designed to exceed your home or business needs and are supported by our highly experienced and local employees. Established in 1996, Kelley Marketing is a full-service, award-winning advertising and design agency located in Munising. We at Kelley Marketing specialize in developing customized marketing strategies that meet your specific needs – from start to finish. We currently provide marketing solutions to a vast variety of businesses throughout the U.S. and Canada. Impact Retailing is a specialized retail consulting firm. From gift shops to large stores, we can help increase your margin of success. By appointment only. Ruff N Reddy provides full-service pet grooming and boarding. Locally owned and operated by pet lovers, we provide grooming, as well as day and overnight care in a secure, clean, and comfortable environment. Pets are an important part of our family, but sometimes circumstances prohibit them from joining us. As pet parents, you can rest assured that it is our top priority to make sure your pet is cared for and as comfortable as possible. Our trained professionals understand proper grooming is essential to our pets overall health. A warm bath, attractive cut and brushing, ear cleaning, and nail cut will leave your pet feeling refreshed and happy. It’s a special bond we have with our furry friends. 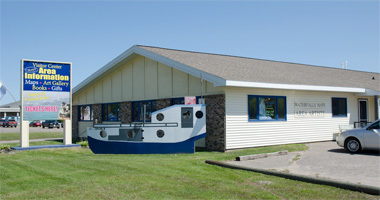 Putvin Drug Store is Munising’s Health Mart pharmacy, your locally owned community pharmacy. Putvins offers service that is personal, professional and friendly – exactly what you would expect from your hometown drug store. Jeff, your hometown pharmacist, and his trained staff carefully monitor each prescription, review carefully current medications, to make certain that all your medications work in conjunction with each other. Putvins Drug Store – where they specialize in caring and service. If you’re looking to move or buy property in the Munising area or the central Upper Peninsula, you’ve found the right page! Our friendly realtors will assist you in finding the perfect residential, recreational or commercial property. If you’re planning to sell your property, they can take care of that, too. Land and Lakes Real Estate, servicing the North Central Upper Peninsula of Michigan, is your Munising and Alger County online resource for residential, recreational and commercial properties. We have an extensive list of beautiful properties with awesome views. Our agents are committed to our buyers to help them find exactly what they are looking for… lakeside vacation retreat, or other type of recreational or commercial property. If you are looking to list your property for sale, our agents will work aggressively to get your property in front of Land and Lakes’ buyers, as well as our network of MLS partners. REMAX Superiorland is HERE for you. We are located by the great Pictured Rocks area in the Central Upper Peninsula. Whether you wish to list your property or purchase your new home/cottage, start your new business, or find your ideally located vacant land, our devoted Realtors will assist you from the beginning to the final steps of all your real estate needs. Visit our office or take a tour of our website and let us know how we can help. Looking for an experienced real estate professional with a vast knowledge of the Upper Peninsula? With over 30 years’ experience helping buyers and sellers of all types of real estate, including commercial, residential, recreational and vacant land in the Central U.P., Betty Kinnunen is the obvious choice for all of your real estate needs! Betty has been the recipient of numerous prestigious awards, including being named the 2003 Upper Peninsula of Michigan "REALTOR® of the Year." With her reputation being well-known all over northern Michigan, she prides herself on always having a "client first" mentality and finds no greater joy than seeing her clients’ reactions when finding the home of their dreams. Serving Alger, Delta, Marquette, and Schoolcraft counties. Member of the Michigan Association of REALTORS®, the National Association of REALTORS® and Upper Peninsula REALTORS®. Stylistics has the ability to make your salon treatment reflect your personal sense of style. We are committed to providing exceptional customer service. Our stylists understand the importance of listening carefully to your ideas and will share techniques to help you achieve your personal style. Be assured, we also use only the finest quality products to achieve first class results. Come in and see what Barbie and her team of beauty professionals can do for you! Relax and enjoy as Mari Jo pampers your hands and feet to keep your appearance professional and well-groomed. Located at Angie’s Beauty Salon in downtown Munising, Mari Jo is a licensed nail technician and maintains the highest standards of cleanliness, health and safety. Out-of-salon services available for bridal parties or small groups. Call and schedule your appointment with Mari Jo today!